Fall is not just allergy season for humans. Though some 50 million people suffer from allergies each year, pets can suffer from seasonal and other allergies as well. In fact, about 10 percent of dogs deal with seasonal allergies and the number seems to grow every year. The main signs that help to determine or discover that your pet has allergies include fur loss, sneezing, coughing, nasal and/or eye discharge, a change in fur color, and excessive scratching licking or chewing of the body. Some breeds have a higher risk of developing allergies. These breeds are Dalmatian, Boxers, Bulldogs, Shepherds, Retrievers, Beagles, Irish Setters, and Terriers. What can you do to help ease your furry friend’s symptoms and suffering from allergies? There are several things you can do to help your dog during allergy season. Use a hypoallergenic shampoo to bathe your pooch, specialists advise that you should give your pet a bath once every two to three weeks. A nice soothing bath not only removes allergens from the skin and fur, it also moisturizes the skin while washing away dirt and bacteria. This may sound a bit much, but it really does help. Dirty pet feet track allergens into the home and all over pet beds or their favorite place to relax. The soak doesn’t have to be like a spa treatment it just needs to be enough to get poochy’s paws clean. It is also good to keep a towel or some paw friendly wet wipes next to the door to quickly clean dirty paws before they come inside. Get the deepest down allergens with a professional carpet and upholstery cleaning. Once you have your soft surfaces deep cleaned keep them as clean as possible with regular vacuuming every five to seven days. For homes with allergy sufferers consider a vacuum with a HEPA filter. During the fall as plants are shedding their foliage, it is very easy for irritants to travel through the air. Reduce the number of airborne allergens by closing your windows and limiting a number of time doors are open. Improve the health of your dog’s coat and relieve itching with supplements like biotin and omega-3. If you think your pet may be suffering from allergies it is best to get them checked out by a trusted veterinarian. Animals can be tested for allergies the same way humans can be. Once your pet’s allergies are diagnosed the doctor can advise one of two treatments to help with allergies. Sublingual Immunotherapy under the Tongue (SLIT): this is a squeeze of medication into your pet’s mouth as an alternative to shots. 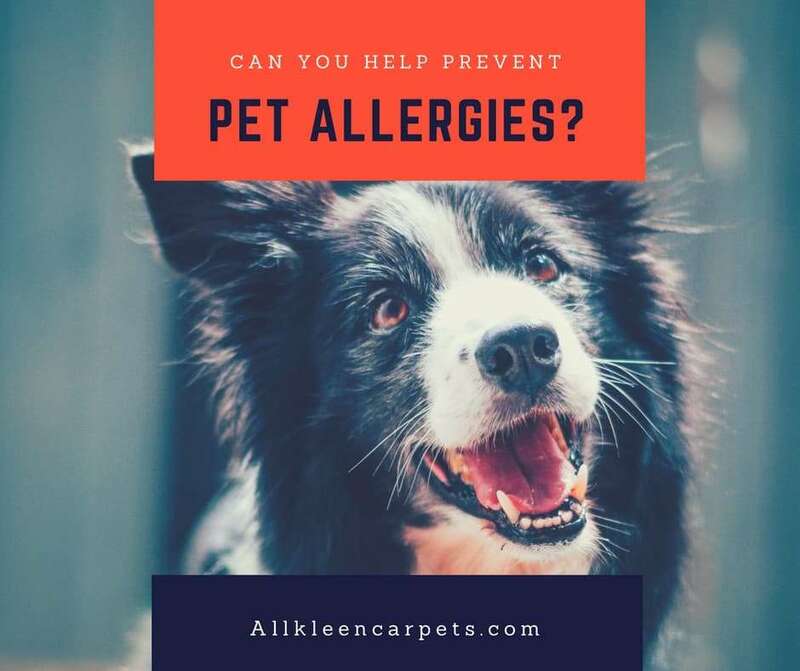 All Kleen can help all allergy sufferers, both pet and human, have more comfortable and healthy surroundings with a professional deep cleaning of carpets and upholstery. Make an appointment online.